At today’s Warner Brothers animation panel, Young Justice producers Greg Weisman and Brandon Vietti joined art director Phil Bourassa in unveiling the new looks for the fan-favorite characters. 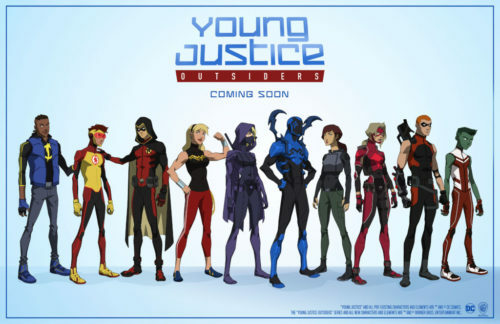 Set to launch Warner Brothers’ new DC-centric digital streaming service, Young Justice: Outsiders doesn’t just redesign the team — it adds a member. In the line-up image, they’ve included Thirteen. Presumably she’s Traci Thirteen, who features fairly prominently in Phil Jimenez’ Superwoman title for DC Comics. The daughter of paranormal investigator (and originally debunker) Dr. Terence Thirteen, Traci is herself a magic user, drawing energy from cities. 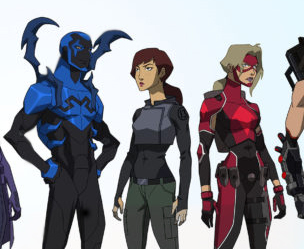 The animated series continues from the Cartoon Network’s Young Justice, cancelled after two seasons and a cliffhanger, but which found new life on Netflix. Weisman (also one of the creators of Disney’s Gargoyles) had urged fans to keep watching on Netflix in order to make a case to Warner Brothers Animation to revive the series. That effort succeeded, and yes, the third season is now coming, but it will not be on Netflix. Instead, it will anchor the DC Direct streaming service that will also feature a Titans live-action show.